I got this card when I was still building my credit up, which was around 590-615 depending. Got approved for a mere $500, nothing exciting but decent. Well after 5 months, on top of getting my collections account removed and getting my first card a CLI, my score has gone up 100+ with this card. Icing on the cake was I was told I would be bumped up to a $750 via the automatic increase offer listed. Well it kicked in today and came to find out it got bumped to $3,500 instead! All in all, couldn’t be happier getting this card will definitely continue to be one of my daily drivers. I applied for this card because CK said I had excellent approval odds (all my credit scores are currently just above 700). I was approved instantly, but with a teensy tiny credit limit of $300. 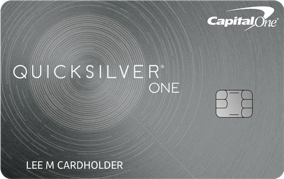 It takes $2600 a year in expenditures to get enough cash back to refund your $39 annual fee, so the joke is on me -- Capital One will definitely make money on me, because there's no way with a $300 credit limit that I will be charging $2600 annually on this card. However, I'm still grateful to Capital One for helping me rebuild my credit with my first Capital One card. I got their secured Mastercard as card number one and it has been fantastic for rebuilding my credit. So maybe this annual fee is a thank-you for that. I'm hoping to get to 750 quicker with two cards. I also really appreciate Credit Karma's help in making me more aware of my credit and especially, of what affects my score. Very hard to get a CL increase with Cap 1. I have other cards with up to 10,000dls, but these people have decided to let me in 850dls after years being a card member. This is why this card is seating in a drawer at home and I'm using my AmEx and Chase-Unlimited instead. I haven't cancelled it because it is my oldest card; Ironic right? I would take my bussiness somewhere else. Already got a higher credit line! I would absolutely start out with a Capital One card. No matter what you’re credit scores are (mine fluctuate between the low and high 600’s) due to a monthly check of about $2,000. They started me out with a $400 limit. Now- thanks to keeping my swipes to a minimum, and using the card responsibility- I have a limit of $750 and I’ve only had the card for about 6 months. MAKE SURE YOU CALL THE COMPANY AND SET UP YOUR PAYMENT DUE DATE!!! Pay on time if not before hand! I went up 100 points in 6 months with this card, and I got a $500 increase after making all my payments. And was able to buy a new car. This card does charge interest so if you can pay the balance off in full each month that would be best. I love the card even though I was approved for a low limit that increased by 200 after 5 months. The card comes in clutch for times where your payday and account balance don't meet up. Excellent card for rebuilding credit!!! I applied for this card with a horrible credit score, I got instantly approved for $500 CL, it's been 5 months now, and CO has helped me rebuild my credit, and after my 5th on time payment they increased my CL to a whopping $3500! Thank you Capital One for the trust. I guess capital one doesn’t understand what the term payoff means because when my next statement showed up I still owed even after asking for a payoff with the interest. After I figure out how to fix this problem I will be closing my account and taking my business elsewhere. PLEASE DON'T CLOSE IT AS THEIR STOCKS WILL COME CRUMBLING DOWN!!!!!!! I SHALL BUILD A GREAT BEAUTIFUL WALL AROUND YOUR CREDIT SCORE TO KEEP YOU FROM RECEIVING ANOTHER CREDIT CARD. They tell you there's no interest for the first five months, then start charging interest the second month! I spoke to four different customer service reps, and they were all *******s with no interest in correcting their error or any concern whatsoever with customer service. I cancelled the card, after giving them four chances to make it right. The idea is not to carry a balance. The online website and app tell you what has posted and what is pending. I find it difficult that you are blaming them.